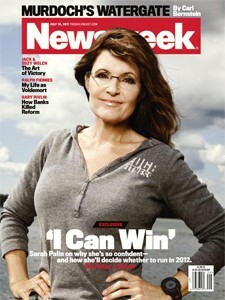 Sarah Palin hasn’t jumped into the race for the White House (yet), but she believes the prize is there for the taking. In a conversation with Peter J. Boyer, Palin warns Boehner not to raise the debt ceiling, proclaims that Obama is beatable—and says the 2012 field is far from settled. 'I believe that I can win a national election,' Sarah Palin declared one recent evening, sitting in the private dining room of a hotel in rural Iowa. The occasion for her visit to quintessential small-town America was a gathering of the faithful that would have instantaneously erupted into a fervent campaign rally had she but given the word. Instead, it had been another day on the non–campaign trail, this one capped by a sweet victory: she had just attended the premiere of a glowingly positive documentary about her titled The Undefeated. Note: Newsweek has rigged their links so I can not send you directly to page 2 of this article. Click the link below, look at the pictures, page down and click Next to continue reading the article.